Looking for a feminine WordPress theme, you are at the right place. With more power to women in every passing day, the virtual world also evolves to support the cause in its own way! No matter if you are a stay at home mom or a fashion celebrity your online presence needs a modern and unique brand . 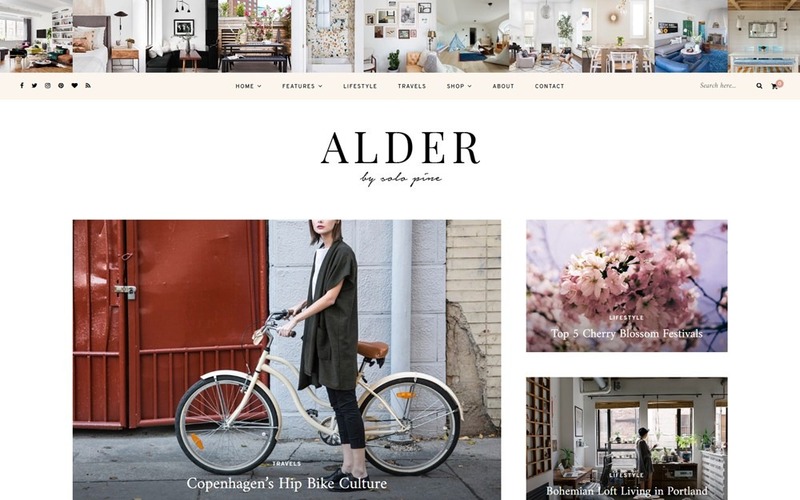 This is where a feminine WordPress theme will help you create a brand for yourself. Today, all the chicas out there do not just go wordy with their blogs, but they also feel the need to go worldly. But how do you go worldly, if what you write is plainly personal or professional? Simple. You “aestheticize” it. Aesthetics are what attract attention and what better way empower your ideas than through expression! There are plenty of options out there for sure. But for your ease, herewith we have compiled a solid list of our favorites resonating with the theme of femininity from all over the internet. The best part, each of our choices go with every kind of blog without stealing focus from the content. Rather, their aesthetics are so appealing that it engrosses the reader in the content completely and we bet you would not disagree! Check out our list of best and most girly feminine WordPress theme. 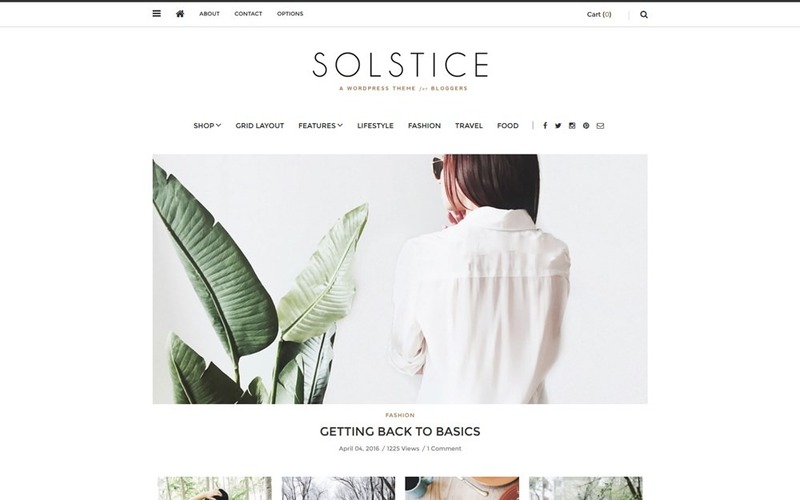 A clean, minimal and easy to use feminine WordPress Theme suitable for all types of blogs. 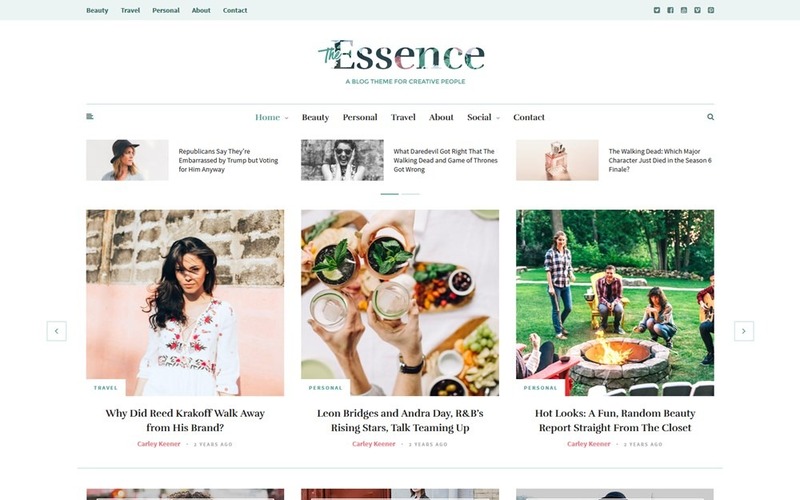 Its an elegant choice for all those who are looking to have a unique site for fashion blogs, travel journals, and photo blogs or storytelling. 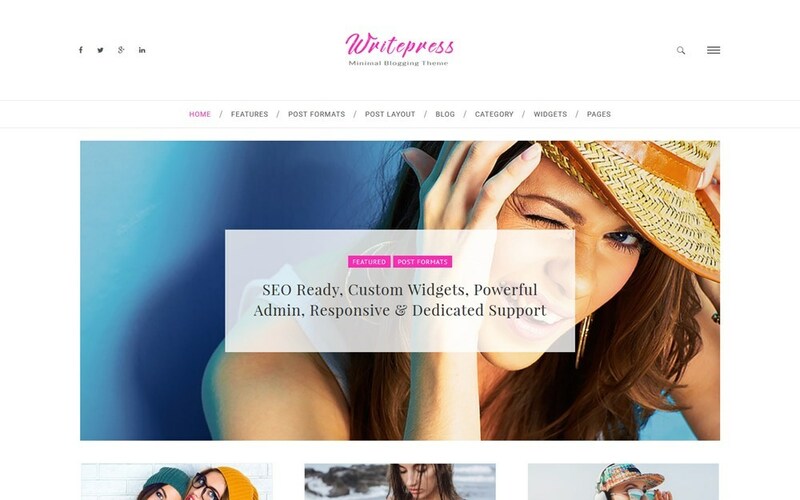 Writepress is the most suitable theme to create any kind of feminine WordPress site as it comes with 10+ different post styles. Also its completely modular with easy-to-use ‘Drag n Drop’ Visual Composer by WPBakery. There are six different single post layouts to suit all sorts of blogging requirements. It comes bundled with many blog carousels, classy designs (masonry, grid, small, medium, large, checkered blog, parallax, full screen, and many more), various post formats and sliders Its uniqueness is added with five blog carousel styles, 15 post styles, headers-footer designs, and more than 600 Google fonts. With unlimited colours, customisable sidebar widget designs and a Powerful Admin, it is 100% Customizable and 100% Responisve. Supported plugins for this site (Contact Form 7, Yoast, WPML, Woo-Commerce & All In One SEO) and the Custom Logo & Custom Favicon functions make it effectively Retina Ready. Additionally incorporating mega menu and sticky menu, it can easily add google analytics and is practised with CSS support. 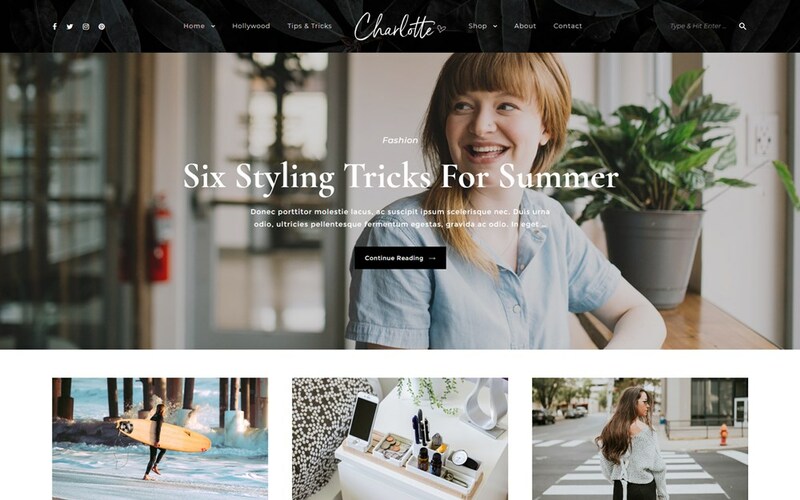 Charlotte- A creative and stylish design which is perfect for for blogs relating fashion and lifestyle . As we can notice in its name this is a modern theme which shows its uniqueness with its “mobile first” design. basically it was 1st designed for mobile and thn was modified for bigger screens. This results in a beautiful experience for the users and mostly the youths of this generation are loving it . Charlotte is also 100% compatible with Woocommerce e-commerce plugin. It has mobile Responsive designs with Featured post sliders with on, off, left or right Sidebar options. It has four Post Layouts, five custom widgets and is Translation ready. Additionally, it supports Contact Form 7 and the Theme options are powered by WordPress customizer. added to its creativity, a visual style editor has been incuded to create an X-Factor. 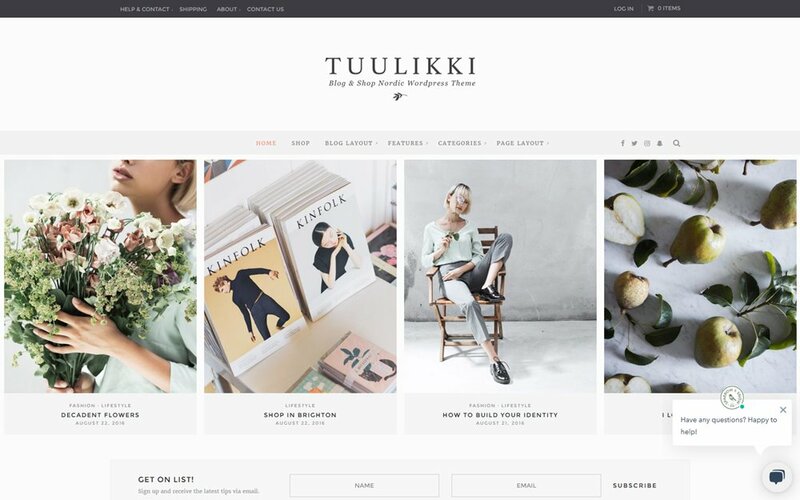 Tuulikki is a creative feminine WordPress theme which gives its users a platform to express or create any personalised blog within minutes. Adding to its simplicity, Tuulikki has been greatly inspired by clean Scandinavian style, which has created bench mark for its essentiality, and elegance. Soft colours, fresh fonts and simple geometrical shapes are the USP of this theme.. 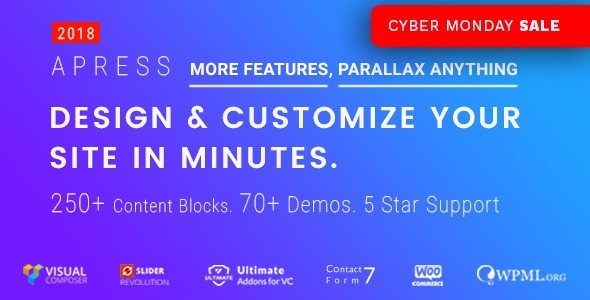 It is One click demo install with Featured Posts Slider, Promo Box, five Blog Layouts, 5 Blog Layouts + sidebar, five Header layouts -, four post formats and eight custom widgets.. It also has Several Homepage Layouts & Built-in Custom Widgets making it extensively develoved and reponsive.. This theme includes Multiple Post Formats, Smooth Sticky Top Bar with Navigation, Sticky Sidebar Feature with Off-canvas Mobile Menu and custom-built Special Post Gallery with Advanced Live Customizer Options.It has been made ready with WordPress 4.5+, WordPress SEO by Yoast plugin, Contact Form 7.. It has Integrated MailChimp Subscribe Form, Unique Logo for mobile devices, Post Like Feature, Home MailChimp Subscribe Box, Social Media Sharing, large variety of Typography And Color Options, six Header Layouts. It also includes Countless Category Listing styles for blog and magazine sites, Home Posts Carousel.. 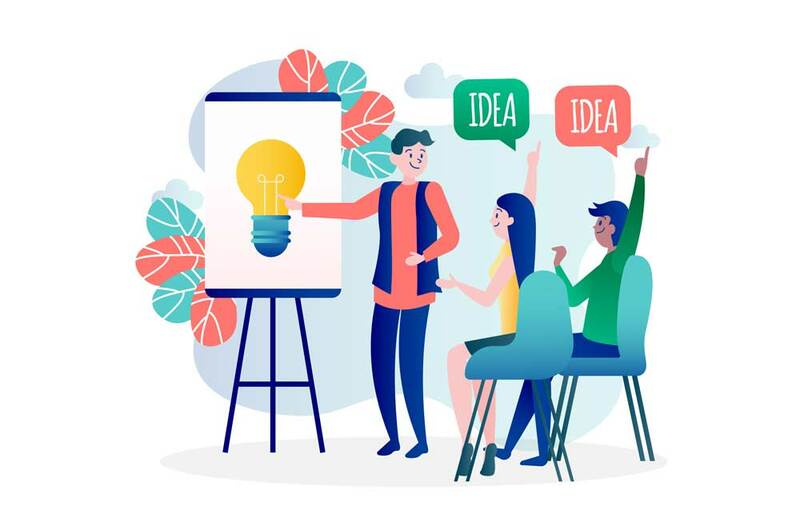 Being Translation Ready with a Long-term Support, Free Updates and new blog features, it has become an instant choice of bloggers as well as customers.. It is a budding ladylike theme best suited for blogs or magazines that deals with luxury lifestyle and fashion.. As it comes with more than 17 various customised creative webpage layouts it has become one of the most asked for theme of this time.. Creating an appealing blog with this responsive and mobile-friendly theme has now become a great hit among the users..It includes Featured slider with Featured posts area.. It has 17 Different Blog Layouts including 3 Widgets.. It Supports for Contact Form 7 &WordPress 3.0 drop-down & has Theme Options Powered by Live customizer and lots of customizable color options with Social Media Icons in Header.. It is Translation Ready and Works with WP 4+.. 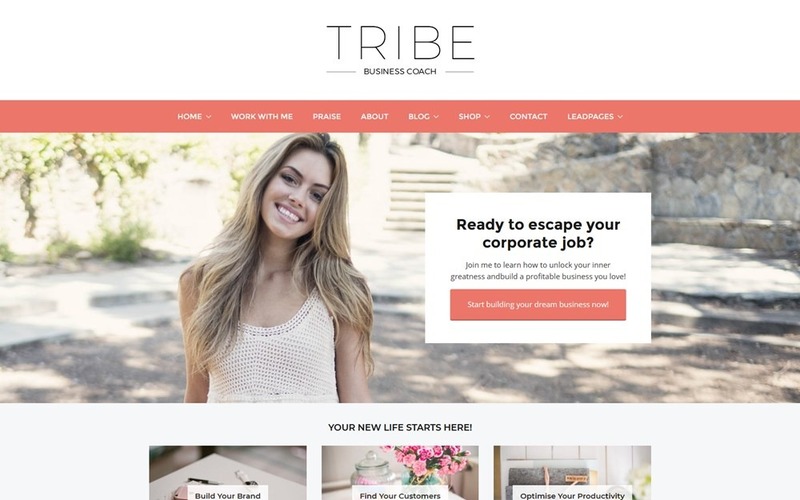 Tribe is one of a kind feminine WordPress theme that encourages its users to create their their own professional website easily.. Its flexibility on coding knowledge, personalized and customer friendly fonts and colors has made it high on demand in recent days. You only need to create a demo and it will make full website keeping in mind your taste. Its eye-catching colours one click creations and extensively developed admin panel has made it the king of blogging themes… this theme is so designed that it can be the answer of an ameture as well as a professional in this field. It has a Clean Responsive Design, 7 Elegant Customisable Layouts, 7 Page Templates, Powerful Live Customizer allowing you to build your blog without any coding knowledge..It is Optimised to capture more leads and grow your subscriber list, WooCommerce Optimized for Coaches, Optimized to boost the shares on Social Media with classic social media icons.. It has 4 customized widgets, 600+ Google fonts with Unlimited Color Options enables with SEO &has 30+.. 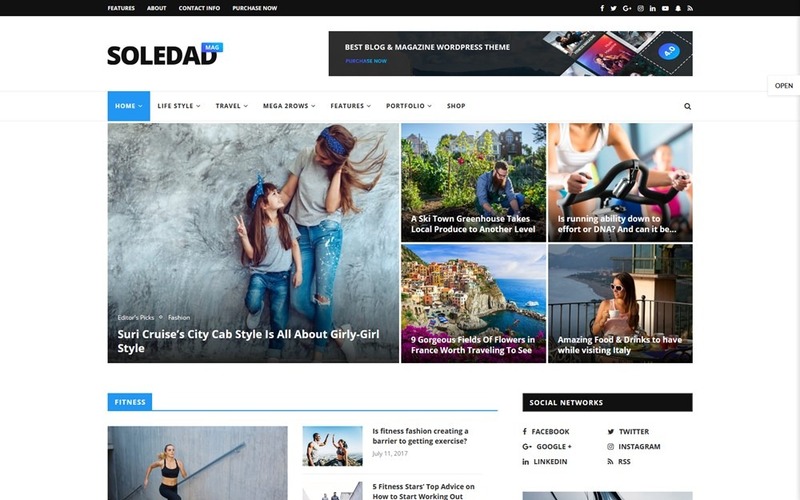 It has One click import demo, and supports Contact form 7 WordPress & Works with WP 4+..
Soldad is a chick style feminine WordPress theme suitable for all types of female bloggers. This theme is said to be the biggest theme which is faster easier and also does not need coding of knowledge which makes it best suited for blogs relating to news, magazines etc..It includes more than 2000 webpage demoes which is of multiple purposes & is Compatible with GPRD policy.. It is supported & validated by Schema Markup & Google Structured Data, Optimized for site speed It has more than 800 Sliders and Blog Combinationsh with Dark Layout.. It supports AMP, Compatible with BBPress & BuddyPress.. It has eight Awesome Gallery with a lot of styles,Category Mega Menu, Fully WordPress Live Customization with 400+ options, 100% Responsive Design, nine Header Styles, 4 Body Styles, 3 Sidebar Styles for all pages, posts, 5 Beautiful Article Styles, Beautiful Featured Slider With 32 Styles, 6 Post Formats, 11 Custom Widgets, Infinite Click Button Load More Posts,Infinite Scroll Load More Posts.. It supports RTL Language & Topbar Menu..It is Woocommerce Compatible.. It has Featured Video Background, Lightbox image in single postsFlexible Images & Responsive Video, Sticky Sidebar, Custom Sidebar For Post & Page, Unlimited Colors..It can Upload custom fonts & 750+ Google fonts including Typekit fonts.. It has optimised Search Engines, is Translation Ready compatible with WordPress 4.0+ supports Contact form 7 & MailChimp for WordPress & has Import Demo In One Click..
An elegant feminine wordpress theme which is creatively designed to display your feminine ideas.. Having clean, bright and eye catching post area with various supporting plugins and widgets this theme shines as one of the chic and high class blogs for budding fashionistas.. 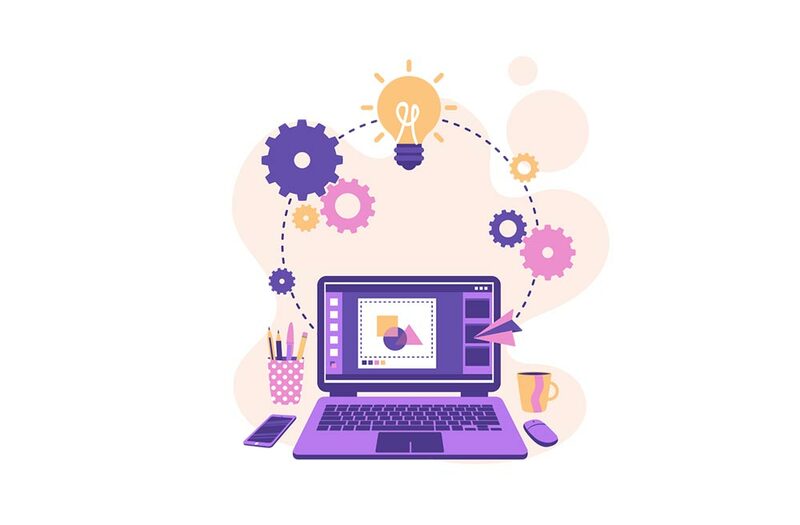 It has sophisticated designed layouts which are mobile responsive, modern and also add feast to the eyes..
Its customization options comes as an advantage to change the theme’s colors or choose from 5 different blog layout options plus master all content with 4 post formats. 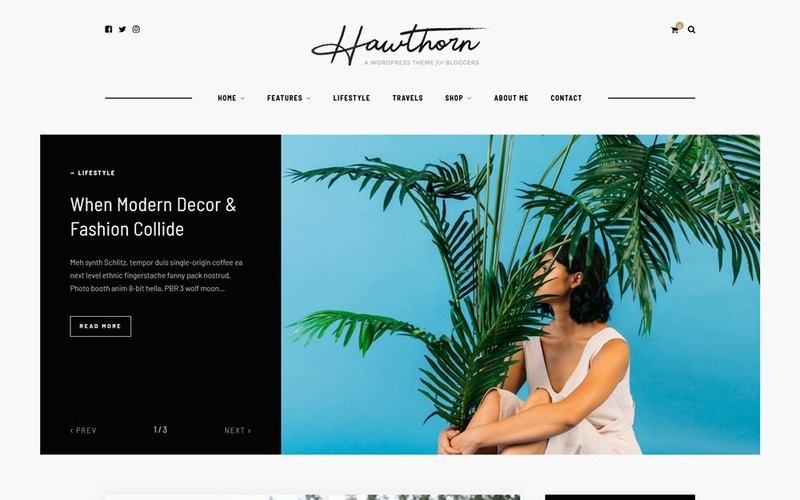 It has 100% mobile responsive design, Attractive segmented Featured Area, Full-width Instagram feed in header, Newsletter form beneath Featured Area & Includes Solo Pine’s Category Index Shortcode.. It is 100% compatible with WooCommerce…It has 5 Blog layouts, 2 Post layouts, 4 Post formats, 6 widgets, supports Custom stylings for “MailChimp for WordPress” plugin to display a polished newsletter sign-up form & Custom stylings for “WP Instagram Widget” plugin for gorgeous sidebar & header feeds.. It Supports & stylings for Contact Form 7..The Theme Options Powered by WordPress’ Customizer.. With Sticky navigation menu, for Page templates and tons of customizable color options, it is also Translation-ready and Works with WP 4.6+..
A theme which is media responsive, elegent, posh and has loads of customisation opntions for its layouts, fonts etc. This year it has added three new demoes and seven block head styles. It includes pre-made demoes with one-click installation and is the first theme to introduce migration plugin without losing any data. It is fully responsive and retina ready. It has AMP integration, WooCommerce integration, bbPress integration, BuddyPress integration, Multiple Skins, Over 20+ demos, One Click Demo Install, Over 800+ Google Fonts, Over 150+ FontFace Fonts, Unlimited Footer Layouts, and Unlimited Headers Layouts. 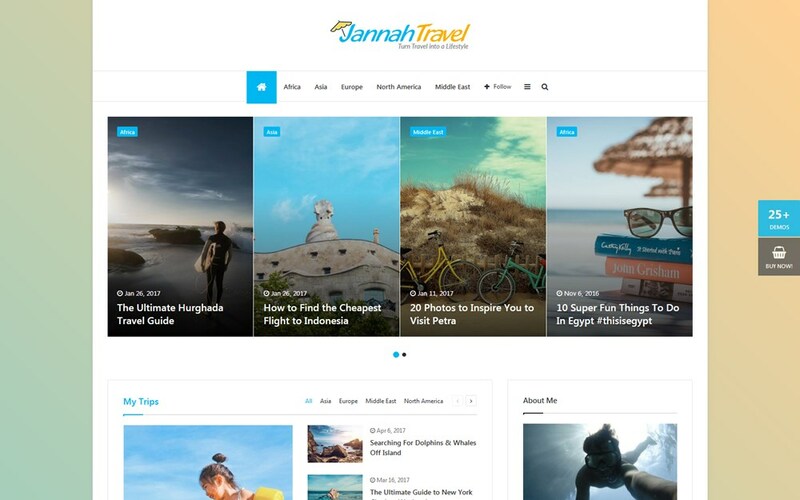 It also consists of a ‘Jump-To Content’ option, Multiple Content Layouts, Monetization, Mega Menus, Amazing Page Builder, Responsive Design, and a 100% RTL Support in Arabic, Hebrew, Persian/Farsi, and Urdu. It is compatible with WPML Multilingual Plugin has Built-in Translation Panel, and animated Weather Widgets. It allows GIF and has countless Premium Plugins, along with BuddyPress Design. With its Instagram Widget, Stunning Video Playlists, Responsive Google AdSense, Dark Skin, Schema SEO Rich Snippet Microdata, and Sticky Navigation Menu it has been mostly preffered for news and magazine blogs . It allows numerous page post with Custom Categories Logo having different Colors and Background. It accepts Sticky Sidebars, Unlimited sidebar, Breadcrumb Navigation. It has customizable options for OFF-canvas Mobile Navigation with Ajax Live Search, 45+ Pre-Defined Background Patterns & Built In Custom Widgets which is compatible with the most popular Cryptocurrency Plugins. 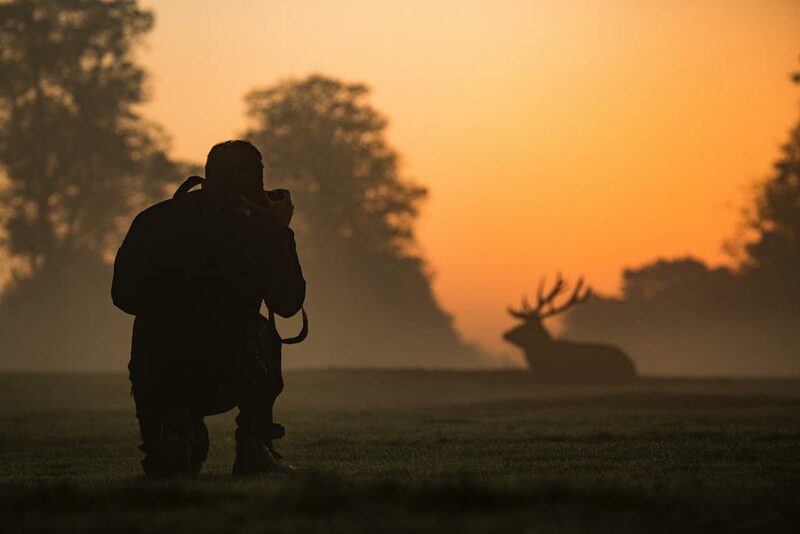 Having dynamic and innovative styling in its features this theme is mostly preferable for passion writers be it photography or food or any other passion. 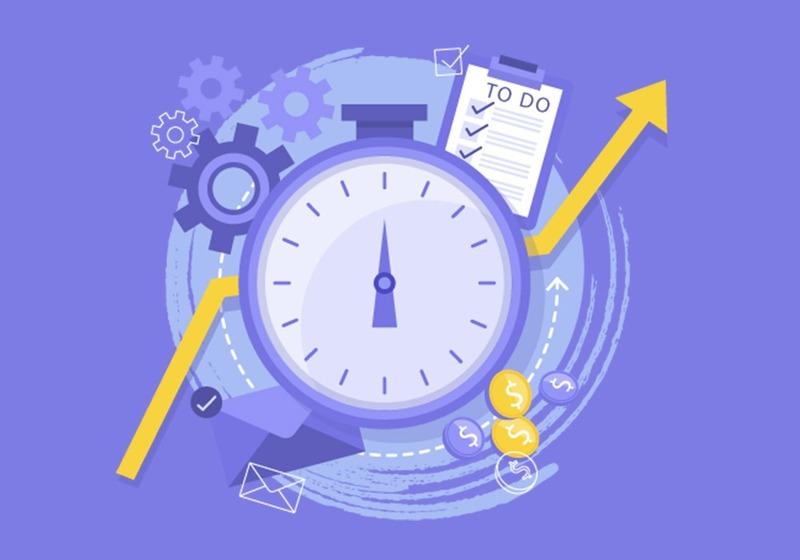 Its prolific structure with eye catching features for numerous post and page templates has made it a visionary in this field. Its apealing colours, ponsive designs have given it a big nod among its users and customers. It is 100% mobile responsive design & 100% compatible with WooCommerce. It allows one-click Demo install with Striking Featured Area Slider and Full-width Instagram feed in footer which also Includes Solo Pine’s Category Index Short code. It has a Robust widgetized footer along with seven Blog layouts, two Post layouts, four Post formats, six widgets, five Page templates and Custom stylings for “MailChimp for WordPress” plugin to display a polished newsletter sign-up form. Besides all these features, it also gives option of Custom stylings for “WP Instagram Widget” plugin for gorgeous sidebar and footer feeds. It also Supports stylings for Contact Form 7. Its Theme Options are Powered by WordPress’ Customizer and has Loads of customizable color options with Social media icons in header and footer. It is Translation-ready and Works with WP 4.6+. 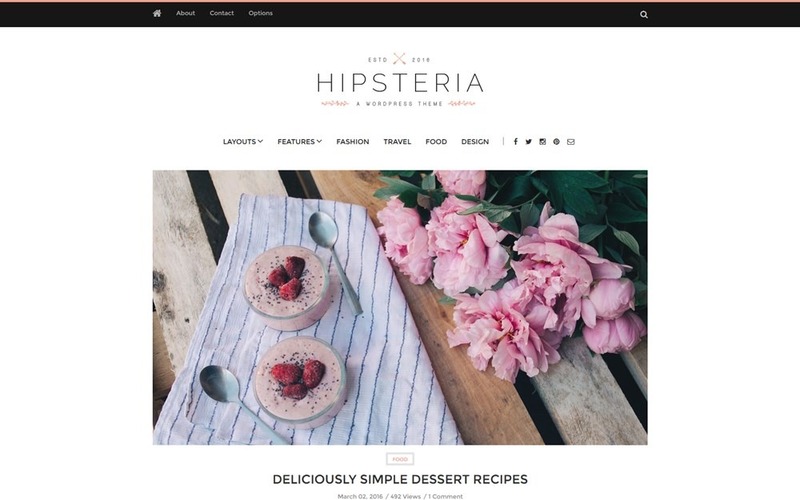 Hipsteria is a powerful, feminine WordPress theme with over 120 styling options at your fingertips. Adding options of customization for changing colors, fonts and layouts it has placed itself in the stage of an versatile blog theme. Its clean and clutter free design has been perfectly suitable for fashion, food, crafts bloggers. It has given the creative bloggers a new platform to showcase their talent with its stunning visual experience and mobile friendly widgets.. Being translation ready and retina responsive it has become Child friendly and child responsive with flexible sidebar. It also has Google Fonts selector for most elements and Color customizer for most elements..It has 2 Layout options, 3 Post Formats, 2 Types of Pagination & 4 Custom Widgets..It allows Contact Form 7 with Sticky or fixed Navigation Option which pave the path to Social Media Icons in Menu and Footer and Optional Header Drop Down Message..It Opens all posts in new tab option for improved analytics & Optional Latest/Popular Stories tabs on homepage..
With more than 140 styling options and being compatible with WooCommerce integration, Solstice is known to be a versatile and multi purpose feminine blog theme for begginers as well as seasoned writers. Its posh and high end striking features has made it lovable and preferred among creative writers.. As it is mobile responsive it is very popular among the teens. Its vibrant colors, chic ideas has made It perfect for fashion blogs, lifestyle blogs, travel blogs, food blogs, craft, tech, creative, photography etc. 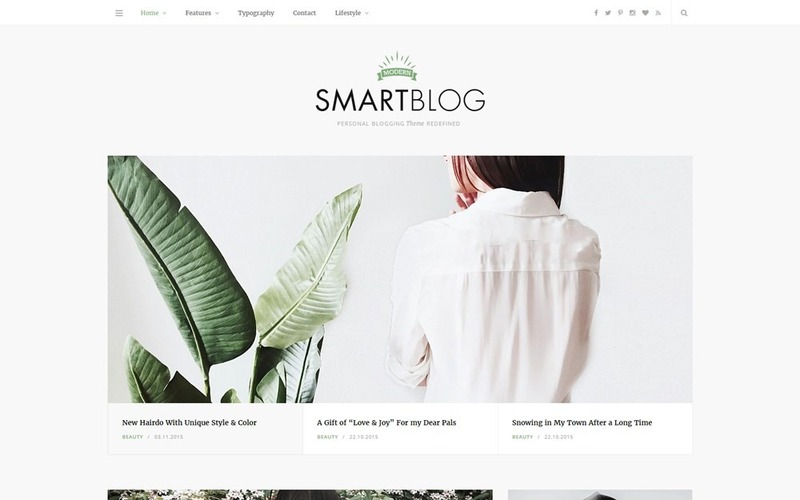 As the name suggests, Smart Blog is a trendy, modern and easy-to-use WordPress theme with flexible and responsive layout where you can customize you themes. The Post Formats can be in Video, quote, image etc. The Widgets for this theme are Twitter, latest posts, Instagram, about widget, social media etc. It has Unlimited colors which can be personalized as desired. It also provides a range of Page Templates (Homes, About, contact, full width etc). It is Cross-Browser Compatible (FireFox, Safari, Chrome, IE9, IE10, IE11) as well as Child Theme Compatible. It is Translation Ready with Fullscreen Sliders and Navigation Menus. It can be automatically updated and has an author biography area. It can be shared on Social media as well. With 439+ Icons, Custom Code Panel and a Theme Installation Video Guide, it supports Bootstrap CSS Framework, jQuery & XML demo content loading. It uses optimized Image and code. 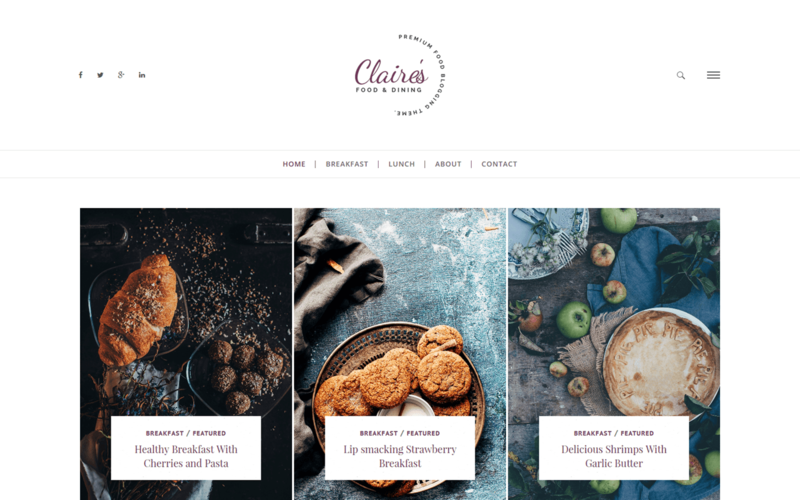 Since these are very creative and easy to use feminine WordPress theme most suitable for feminine bloggers, they need very little or no technical help to get started with your blog. So what’s your favorite theme !